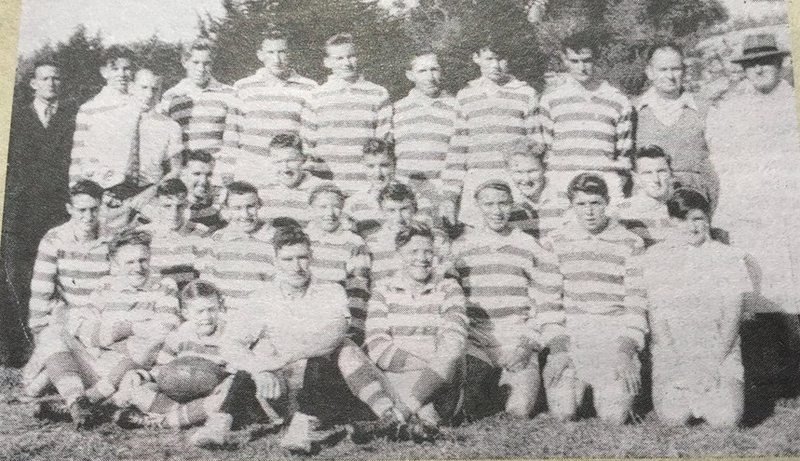 The history of the Bridgewater-Callington Raiders is the history of two proud football clubs, which have been integral to their communities for over a 100 years. Their merger in 2013 has been mutually rewarding and will ensure that Callington and Bridgewater will be represented on SA's ovals for many years to come. Go you Raiders! The firsts records of a Bridgewater Football team date back to 1895 when the local lads took on Mt Lofty in a friendly. A team continued to exist right up to the 1940s when they came close to joining the local competition. However, it was not to be and so it was only in 1956 that Bridgewater joined the HFA. The club had been properly reformed and became the founding body of the future Raiders. The start was difficult and victories were hard to come by, but the tide soon turned with a senior premiership in 1959. Bridgewater may not have officially belonged to an association until the 1950s, but it did have great players such as Bert Schumacher (picture). Bert (born in 1897) kicked his first football at Bridgewater Primary School and later became a "goal sneak" for the Bridgewater senior team (at about age 13), as shown in the report of Bridgewater's comprehensive win against Grunthal (now Verdun) in 1912 (Bridgewater 11 goals 15 behinds - Grunthal 1 behind) where "Schuey" kicked three goals. Bert saw active service in World War I from 1917 onwards and then returned to play for Norwood from 1920 -1927. He played in three premierships and kicked 72 goals in 107 games as a highly effective rover. Schuey was also selected for two interstate matches. Unfortunately, Bert passed away in 1972 (aged 74), but he is remembered here as one of Bridgewater's great champions and a superb footballer from the Hills. When my dad, Mal Lang, passed away, Mum said we should spread his ashes on the oval as " he spent most of his life on it" He was a founding player, committee member and later president. We four children laughed at Mums comments. Also remember driving around and around the oval in a cut off Erskine car pulling a wide cutter to mow it. Dad and his mates also lit fires in Hutton Cottage every home game, to heat the water for the A grade to shower after the game. Happy memories and glad to see the club progressing so well. 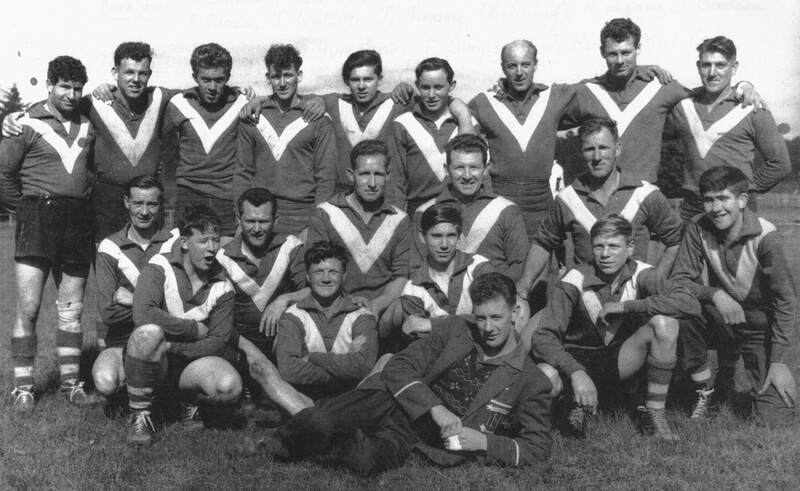 Prior to joining the Hills Football League Bridgewater had competed in the old Hills Football Association from 1956 until the competition disbanded in 1961, capturing a senior grade flag in 1959, before spending the next five seasons in the Torrens Valley Football Association. In 1963 the club won a senior grade TVFA premiership after an 11.7 (73) to 9.3 (57) grand final defeat of Eden Valley Rovers. The original Bremer/Callington Football Club was playing challenge matches as early as 1903. The club was called the Bremer Football Club from 1950 (approximately). It merged with Nairne at the end of 1978. 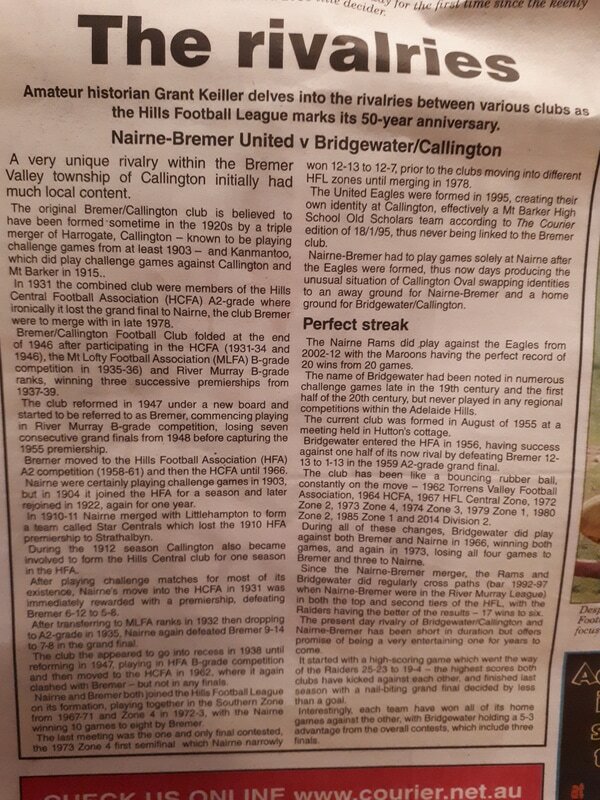 In 1995 the newly formed Callington United Football Club joined the Hills Football League - Division 2. In 2003 they joined the Hills Football League - Country Division. Known as 'The Eagles' their colours were blue and gold. In 2009 the Callington United Eagles made national headlines with their undying club spirit and never say die attitude to keep the Eagles alive (see video). When the two clubs merged in 2016, it sparked the most successful era for either team with the A-Grade reaching back to back Grand and Courier Cup finals in 2015 and 2016 in the HFL Second Division. 9 9 to end 35 years of premiership drought (see below). 2017 saw the club win their first ever back to back senior trophies when they secured the Courier Cup for the second time in two years. This was followed by the B-Grade winning the premiership.